Though not considered an immediate risk to most cultural heritage collections, subterranean termites (Reticulitermes spp., Coptotermes spp. and Heterotermes spp.) are a pest of significance in the heritage community. Colonies ranging from a few hundred termites to several hundred thousand can cause extensive damage to historic structures before evidence of infestation is noted. Control efforts are challenging due to a variety of factors, including termite adaptability, intricacies in building design, necessity of implementing least-invasive control methods and limitations of product efficacy. Am I at risk for subterranean termite infestation? 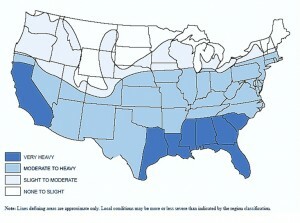 If you live in the United States, your risk increases in the southern and coastal areas highlighted in blue. What kind of risks do subterranean termites pose to my collection? Historic houses or similar structures. See Preserving History: Subterranean Termite Prevention in Colonial Williamsburg for a more in-depth assessment of risk factors that attract subterranean termites and how to minimize them at your institution. Antiques made out of paper or raw wood (especially book archives). Subterranean termites have been known to construct shelter tubes across concrete, metal, and other inedible surfaces to infest cellulose-containing material. Support buildings, offices or storage units fabricated with cellulose-rich components (including drywall). How can Insect Growth Regulators (IGR’s) help prevent termite infestation? Over the last twenty years, termite baiting with IGR’s has become a popular replacement for traditional liquid trenching treatments. Since subterranean termites spend most of their lives underground, the majority of termite baiting systems involve the installation of below-ground feeding stations at 10-20 foot intervals around a structure. The stations are typically prebaited with a nontoxic, cellulose-containing material to instigate large-scale consumption by the worker caste. In theory, workers foraging in a given area near the protected structure eventually wander into one or more of the stations and begin to feed. When activity is noted, the original nontoxic bait is traded out for bait impregnated with a termiticide. In most cases, a slow-acting insect growth regulator is used to disrupt the breeding cycle of the colony. The colony declines and eventually collapses as the worker population is reduced. How do IGR’s affect subterranean termites? 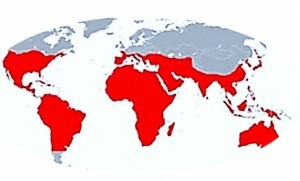 Insect growth regulators designated for control of subterranean termites are usually classed as chitin inhibitors. During maturation, juvenile termite workers increase in size. As a result, they outgrow their exoskeleton. Since the termite’s internal moisture level is sustained by the exoskeleton, the growth process could cause premature mortality due to desiccation. To alleviate the problem, the termite’s body produces a carbohydrate called chitin to form a new skin. As the termite grows, the old skin is cast off in a process called molting and the new layer underneath remains intact through the next stage of development. This process may occur many times during maturation. Chitin inhibitors disrupt the juvenile termite’s ability to produce chitin. Without the new exoskeleton, the termite expires quickly during/immediately after molting. What are the advantages in using IGR’s (baits) for subterranean termite control? Termite baits leave a much lighter environmental footprint than traditional liquid treatments. Termite bait placements specifically target the subterranean termite colony, so secondary poisoning of non-target insects is not an issue. Termite baits that use IGR’s are thought to be safer than alternative treatments because the active ingredient targets a process unique to insects rather than neurological processes shared with humans. Data pertaining to activity is easier to track because bait placements are checked regularly. Subterranean termite baiting systems like Sentricon (Dow) offer above-ground bait stations that can be used if termite activity is found above ground or inside of a structure. Results may vary in station effectiveness. What are the disadvantages in using IGR’s (baits) for subterranean termite control? Subterranean termite baits can take up to a year or longer to critically impact a colony. In the interim, consumption of cellulose inside the infested object or structure continues unabated. Bait competition with cellulose-rich structural elements is a concern. Even when bait stations are installed by experienced professionals, subterranean termites do not always find the placements or choose them over more attractive feeding sites. Instances have occurred in which subterranean termites have wandered into the foundation of a building within two feet of an existing bait station. No activity was found in the monitoring wood of the station. Chitin inhibitors only affect immature workers that are still subject to the molting process. Adult workers, reproductive castes, and soldiers are unaffected. If the reduction in immature termite workers is too slow, the queen can initiate additional reproductive activity, giving the colony a better chance to recover. Subterranean termite baiting systems require more maintenance than traditional liquid treatments, increasing the cost for the consumer. Regular, detailed site inspections that will allow for early detection of system failure. Installation of additional termite stations in foraging-prone areas. Targeted spot treatments with foam or liquid termiticide if bait stations fail to eliminate colonies.